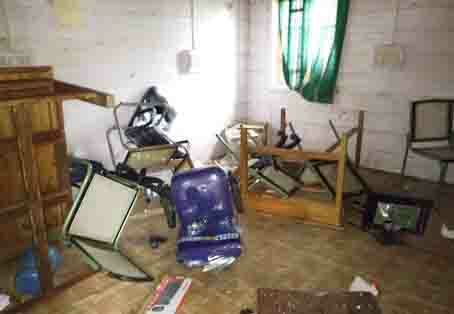 MECHUKHA, Nov 8: The BSNL office here in West Siang district was reportedly vandalized by agitating volunteers of the United Students’ Organization during the 24-hour ‘chakka bandh’ in the town on Tuesday. The BSNL, which is the lone cellular service provider in Mechukha, remains completely disrupted since the incident. Apart from the BSNL office, the angry mob also reportedly vandalized the offices of the community health centre (CHC), the RWD, the BDO, the PWD and the WRD which were reportedly running without HoDs and officials. The organization had declared the 24-hour Mechukha township bandh from the morning of Tuesday to press its demand for immediate replacement or upgrading of the existing BSNL connectivity with 3G services. It is also demanding posting of a dental doctor at the CHC; maintenance of the township football ground; making the x-ray machine at the CHC functional; and taking stern action against irregular government officials. With the support of the public, the organisation said it would launch the second phase of its movement on 23 November if its demands are not met by then. The authority in charge of Mechukha subdivision could not be contacted for updates on the damages due to unavailability of mobile network.